Discover health benefits of blueberries for the body, skin and hair! Blueberries are a small, round, sweet tasting fruit with a blue, indigo, color. They're harvested from April through October. This perennial flowering shrub grows four to six feet in diameter. It needs full sunlight and well-drained soil to survive. 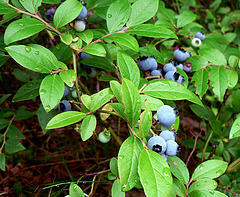 North America is the largest producer of blueberries in the world. Blueberries contain vitamins A, B, C, and E. They have fiber and are loaded with antioxidants. Anthocyanin, an antioxidant flavonoid, gives them a blue, indigo, color. The deeper blue in color, the richer they are in antioxidants! Blueberries are low in calories. They consist of approx. 85% water. One cup of blueberries equals about eighty calories. This delicious fruit is known as a "superfood". Store blueberries in your fridge for longer life. Eat firm, plump, smooth skinned, deep blueberries. Generally, they should be eaten within a week. Fresh berries, stored in a fridge, may last ten to fourteen days. Eat whole, mix in a smoothie or bake them in a pie! There are lots of ways to eat this nutritious fruit! Blueberry juice is a tasty antioxidant drink, too! Blueberries contain potent antioxidants. These antioxidants have anti-aging properties. They promote healthy skin and improve appearance. They combat free radicals that cause pre-mature skin aging. The appearance of fine lines and wrinkles are reduced. Blueberries hydrate the skin. Vitamin C in blueberries helps strengthen blood vessels just below the skin surface. This helps combat bruising, spider veins and splotchy skin. The abundance amount of vitamin B helps tone skin and promote cell growth. Blueberries, increase blood circulation for an overall, healthy glowing skin. There are topical products on the market with blueberry extract like: soaps, lotions and creams. Natural goat milk soap is nourishing for skin. Goat milk contains vitamins A, B, C, D, E and K! It helps skin stay close to its natural ph level. It helps regenerate collagen under the skin, negating the visible signs of aging. It's a natural moisturizer. Goat milk soap comes in many different varieties, depending on the ingredients used. A blueberry goat milk soap may help improve the, overall, appearance of your skin! Mix approx. 10 blueberries with 1 tablespoon of plain Greek yogurt. Blend together well until completely smooth. Apply a thin yogurt mixture to face. Avoid eyes or other skin sensitive areas. Leave on face for, approximately, ten to twenty minutes. Rinse face with cool water and gently towel dry. If you experience skin irritation discontinue immediately. Consult your health care provider, if needed. Use a blender to mix the following ingredients: ¼ cup organic blueberries, 1 tbsp raw organic honey and 1 tbsp organic olive oil. Carefully, remove mixture from blender. Gently apply mixture, evenly, on face. Avoid eyes, ears or other sensitive areas. Leave on face for approx. 5 minutes. Rinse face with cool water or remove mixture with cool damp cloth. Gently towel dry face. If you experience skin irritation discontinue immediately. Consult your health care provider, if needed. Blueberries have loads of vitamin B. Vitamin B aids in cell reproduction for hair, skin and nails. It increases hair growth by improving blood circulation and oxygenation within the body, mainly the scalp. A blueberry shampoo may help improve your hair and scalp conditions. Look for a natural shampoo with no parabens and no damaging sulfates.